See more objects with the tag geometric, sleek, entertaining, cocktail, Kem Weber. This is a Tray. It is dated ca. 1928. 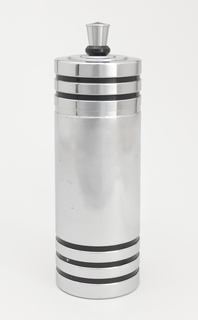 Its medium is electroplated nickel silver, rosewood. It is a part of the Product Design and Decorative Arts department. 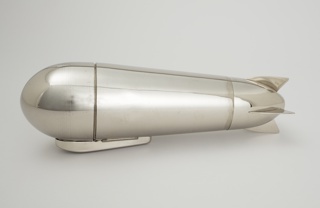 Berlin-born architect Kem Weber arrived in the United States in 1914. 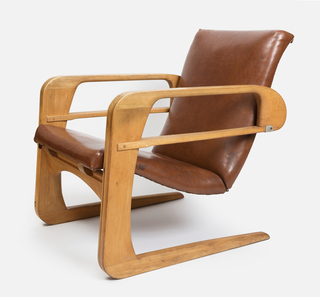 Along with other architects from Central Europe who came to America at about the same time, including Paul Frankl, Rudolph Schindler, and Ilonka Karasz, Weber would hold great influence over the trajectory of American modernism. 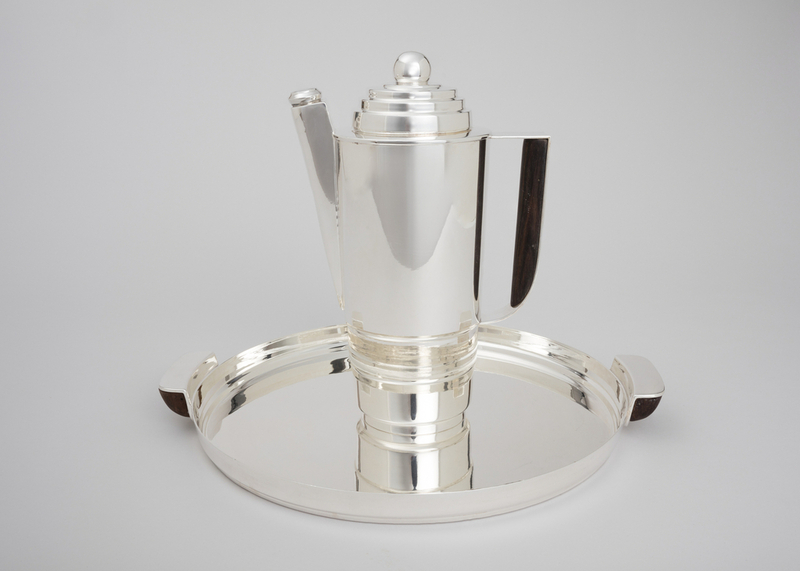 After he had made his mark on the west coast, designing modern wares that sold in the “Modes and Manners” shop at the department store Barker Bros., Weber’s influence also secured some roots on the east coast when in 1928, the Friedman Silver Company of Brooklyn issued a Kem Weber signature line of silver-plated tea and coffee services, cocktail shakers, and barware. 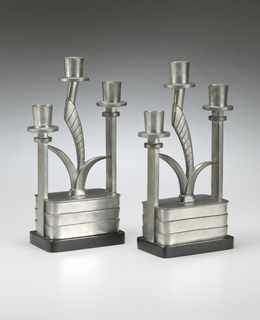 These contemporary hollowware pieces were designed for mass-manufacture. 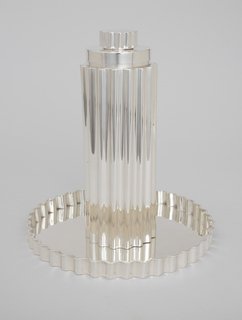 Weber offered two distinct lines: “Today” and “Silver Style,” to the latter of which this cocktail tray and shaker belong. The shaker and tray’s designs exhibit a piecing together of basic geometries. The shaker’s top shows the ziggurat-like gradation of a skyscraper and is topped with a sleek orb whose handles appear as rounded rectangles. The tray is a simple circle with handles in flat rounded rectangles of wood and metal. Every angle and curve references Weber’s elegant take on machine aesthetics, a point of view similarly executed in his furniture and other decorative designs. 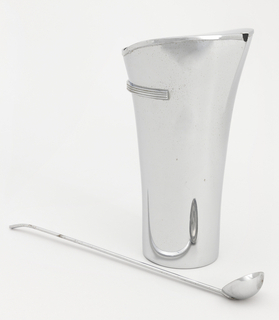 Weber once remarked that his approach to designing a product mandated “keeping it simple and swift in line, not overly complicated, and yet giving it a certain rich elegance…that is typically American.” Simple and swift in line, not overly complicated, and a rich elegance are all attributes of these sophisticated drinking accessories. birch, ash, naugahyde, steel tacks. impressed "SILVER STYLE/Kem Weber/DESIGN/E.P-N.S./16E4 and a D within a circle"